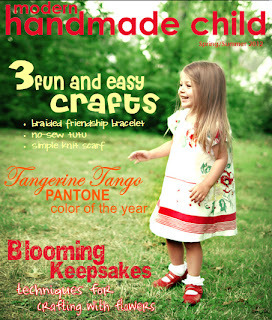 Modern Handmade Child: Spring/Summer 2012 Issue out now! Spring/Summer 2012 Issue out now! The temperatures are rising, the sun is shining, and Spring is definitely here. After the cold dark days of winter, there is something about this time of year that is so welcoming. From the first buds of the season, to flowers in full bloom, there are so many moments to enjoy about this transitional season. We have been doing some transitioning of our own, and couldn't be more excited to unveil our new design with our Spring/Summer 2012 issue! This issue is full of handmade goodness that will surely put you in the mood for Spring and Summer - from handmade fashions for kids to fun craft projects and tutorials, from inspiring interviews to tips for living green. Simply click on the cover below to hop into Spring! I love the previous copy of this magazine where they featured fab collections of emile et rose baby clothes. There's always something new and something to look forward to with their releases.